Nowadays, managing a Facebook profile for our company can be a real piece of cake. If we know exactly what to ask uncle Google, 10 minutes is more than enough to get answers on how to manage our profile, upload our content and connect with our followers, buyers or merely virtual passerby. We can even get enough information on basic advertising. However, a Facebook post isn’t merely an uploaded photograph or video. It is a message to everyone who sees it. And that message needs to be effective, from the first to the last letter, if we wish to evoke some kind of response and not merely get lost in one of the numerous posts out there. The main part of a post, which puts our visual material into a meaningful context, is the content. With it, we can direct the reader’s perspective (e.g. by explaining the context of the photo) and can even encourage them to perform a certain action (e.g. read an article, buy a product, state their opinion), so writing a piece of content cannot be taken too lightly. Many of you might claim that a knack for writing is something you either “have or don’t have”. However, even though we weren’t all meant to become the next Shakespeare, it doesn’t mean that our posts should be missing a good strategy. So how to get started on writing Facebook ad copies that will effectively present your company? The biggest mistake you can make when writing a Facebook post is to rush it. I can say that from experience. :) When you’re in a rush, you get sloppy, which can – in best case scenario – result in a missing comma or – in the worst case scenario – in an avalanche of negative comments and a loss of followers. Take your time and think about what you want to convey and how best to do that. Check all the information in your post and scrutinize it as much as possible. 2. Know your audience: Who are you addressing and what’s their problem? Just think about how you select different services and products for different target groups – now all you need to do is tailor the manner with which you present those products on your social media. While writing the copy, you should always keep in mind the client you wish to influence with that particular post and the problem you’re trying to solve for them. While writing the text, you should always keep in mind the client and their problem. If your target group is a group of ladies who value long-lasting products and their craftsmanship, then your post about woolen mittens should include the mentions of handy work, details and quality material. For all those fashionistas who are looking for the tenth pair of mittens to go with their new coat, this same text (no matter how perfected) simply won’t have the have influence. A piece of advice: While writing the copy, imagine your typical target customer. What is their problem and how does the text make them feel? What would they wish to know about the topic you’re writing about and which answers would they have? Try and answer them. Choosing the right words is sometimes a lot harder than it seems. Numerous repetitions of “very”, “most” and “nice” merely show just how limited our vocabulary is (or at least point to our lack of trying). However, using expressions that are too technical, also doesn’t speak to our advantage. If we wish to present ourselves as experts in our field, we of course need a certain amount of professionalism, but we must always keep in mind who our target audience is. If we throw a lot of professional expressions at amateur beginners who don’t understand a word we’re saying, they won’t be able to relate to us, which could potentially cost us a customer. Social media, such as Facebook, are nevertheless just that – social. It’s important that our posts don’t lose our authenticity and human factor. The communication with our customer should resemble a real-life conversation as much as possible – and should avoid looking like a well-written doctorate. A piece of advice: If you catch yourself always using the same words, it never hurts to look for new ideas using Thesaurus. Sometimes just altering one word can elevate the entire sentence. With our fast lives and the number of information we receive through social media, the golden rule of writing became “Short, but sweet”. Research has shown that the best performing posts are those under 80 characters. However, if you think about it, we’re more than willing to read an entire Facebook novel when it comes to a topic we’re truly interested in. So, is it true that we must always stick to short texts? Is it true that we must always stick to short texts? Yes and no. Long posts are more than welcome when we don’t have e.g. a landing page, where we could describe our product or service in more detail, or when we believe that we’re dealing with content that is particularly important for our Facebook strategy (various personal (or powerful business) stories, experiences and addresses to our target audience). However, when the goal of our post is to redirect our reader to a new blog post, it really makes no sense to waste the reader’s (and our) time with putting half of the article in the Facebook post. Seeing how – instead of actually reading – we’re more used to scrolling down our Facebook feed, we must take the product’s best features and masterfully intertwine them in a few lines if we want our message to be seen. A piece of advice: If it’s impossible to avoid long texts, you can make them more “readable” by arranging them into meaningful paragraphs and dividing them with empty lines. If your tone of communication permits it, you can lighten the mood of the post by using emojis (which should never replace the actual words due to different displays on different devices but should merely complement them) or by using emphasis (e.g. capital letters). 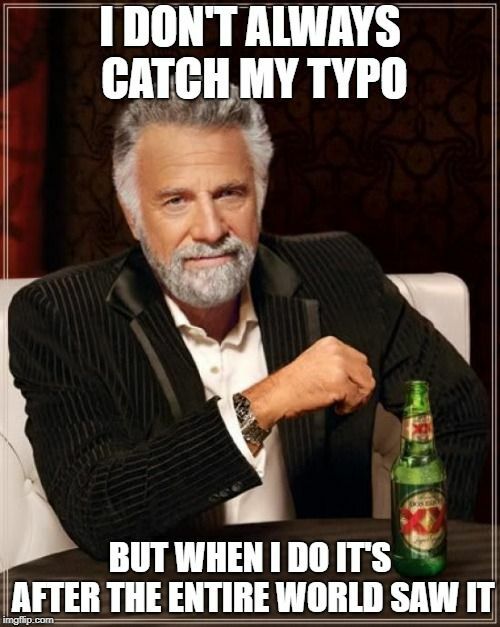 Have you ever found yourself in a situation where you only noticed your typo when the post has been live for several hours (and was already supported by numerous comments)? You’re not the first nor the last one; after all, to err is human. However, every mistake in your copy, which is supposed to represent your company and the quality of your service or offer, diminishes your authority. Before you eagerly click on that “Publish” button, it’s more than advisable to take another look at your text or ask one of your coworkers to do it for you. A lot of times we simply won’t notice our mistakes because we’ve gone over the copy so many times. Another useful advice here would be to copy your text into a different format; by moving your text into a different document and by choosing a different font, size or alignment, it’s easier to spot all the mistakes what eluded you before. The mistakes in a public post can quickly turn against you. A piece of advice: In Optiweb, we resort to the program Grammarly for all those missing commas, incorrect conjugations and redundant or missing letters. Revising your grammar is of course inevitable. The function of our style of writing can be compared with the corporate design of our company. By constant repetition, we create a certain style, which will instantly remind our customer of our brand, product or service and thus separate us from the competition. At the same time, it will help us reach those people who identify with our communication (and consequently our philosophy). If we therefore wish to present ourselves as a professional, disciplined and serious company, the right choice will be a stricter tone and a clear expression of our demands, perhaps even by using short and precise sentences, while a more sophisticated tone would also require a use of foreign words. A company that establishes itself as having friendly relations and wishes to convey cunningness and wit through its work, could try getting close to people by using various word plays and perhaps diminutives, archaic expressions or conversational phrases. A piece of advice: Think how you would address your customer in a physical store or your offices. What kind of words and tone would you use throughout the conversation? Just because the post is now written and published, it doesn’t mean our job is done. Communication on Facebook (as well as other social channels) can be mutual: people leave a comment or a message in our inbox with a certain question, to recall the good (or bad) experience they had with us or simply to say what they think of our newest product. It’s important that we respond to that – as soon as possible, of course, and especially by using the same style that can be found in our posts. The communication must be consistent on all social channels, so we can let people know there is an actual person behind a company name; a person who is always there for them. For any additional directions and questions we will be more than happy to respond to your comment, but if you feel as if all this is simply too much for you, quickly write to us so we can take some of the burden of your chest.